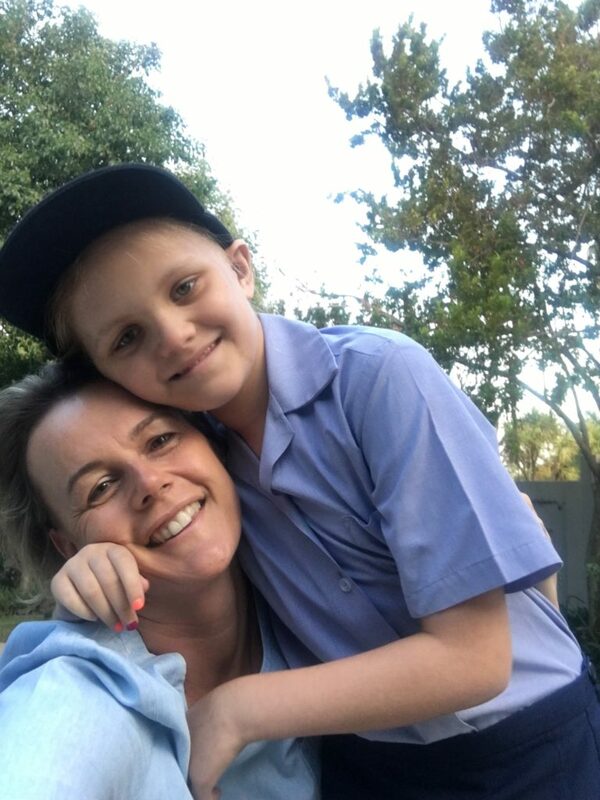 As we arrive at the Radiation Oncology Treatment Centre, Georgia in her glitter slip slops skips past the queue of waiting patients to the Treatment Control room to hand in her card. She smiles at the receptionist as she races past and the gaze of the other patients follow her. What follows for the next 20 minutes while we wait is an endless stream of cappuccinos being forced down my throat as Georgia is amazed by the coffee ma chine and pressing the buttons. We read and she tries her hand at knitting (but not for long). When her turn comes she goes into the treatment room and climbs onto the bed, the therapists attach the mask that will hold her still for 25 minutes while she receives her daily dose of radiation to her brain and spine. Once the treatment is over the therapist gives her a sweet and she sticks a sticker on her Star Chart, one more down! She races out of the treatment room, past the never ending line of waiting patients and once again their gaze follows her as she exits and the door bangs shut behind her. Tomorrow we will be back and the same routine will be repeated until all 30 sessions are completed. Georgia (Age 7) was diagnosed with a brain tumor in early September this year. Having already had and lost a child to cancer, the shock and absolute cruelty of our situation has left Grant and I completely gob-smacked. Georgia had the tumor removed on 12 September and has since that time gone from strength to strength. Unfortunately for her and us, surgery is not the only treatment she requires, she is currently undergoing radiation and will then proceed to chemotherapy for a period of 4 to 5 months, all being well. However, I am writing this letter not because we need sympathy, far from it, despite the unfair turn of events, we feel blessed that we know that in the hands of the Pediatric Oncologists who look after Georgia at Donald Gordon we have a team of doctors and professionals that truly are world class and will ensure that she gets the best treatment possible. Not only that, in the same environment social workers will assist Georgia and us in dealing with the complex emotional road ahead. These dedicated professionals are in place in all Pediatric Oncology Treatment centres across South Africa, CHOC makes sure of this. CHOC also ensures that social workers are provided and that key barriers to treatment are removed from the families by providing transport to hospitals as well as housing and food for the duration of treatment. Once again as we spend time in the wards, we are reminded of the strength and innocence of kids fighting cancer, it’s like a like a breath of fresh air. They don’t consider for a single moment that they wont win the battle, they give it 100%, they speak their truth and they love unconditionally. LOVE LIVING LIFE is what they practise each and everyday!